I typically try to set up invitations and do activities based on the interests of my son, but I have to admit that was not my motivation here. I made these for my students when I taught pre-k and the 4 year old children LOVED them, so I wanted to share them with YOU. What's the point behind these? They are great for learning about ones self, facial features, fine motor skills, pre-writing skills, imagination, etc etc. Most of all, they are just FUN and my tables were full of giggles when the students would bring these out. To my surprise, my son really enjoyed these. Here he is coloring RLs youngest. "Mommy, I need a beard like Daddy." Here is another fun option - puppets. I also made these for my students when I was teaching. You take a full body pic, print it on card stock, cut it out, laminate it, cut it out, and use a hot glue gun to mount it on a toilet paper roll. Playing with his puppets....still clothed. 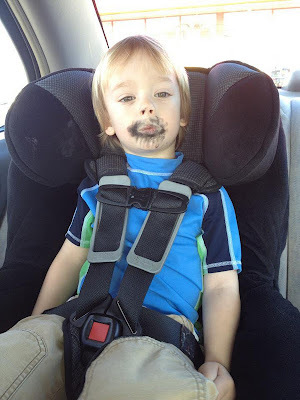 I love that you let him run errands looking like Dad, lol! This is such a great idea--I'd like to invite you to share it on the linky party at http://preschoolpowolpackets.blogspot.com/2012/01/teach-me-tuesday-1-17-12.html -- I hope to see you there! How fun is this! I'm going to get some giggles out of this too :) Also----for those of you who don't own a laminator, I've used contact paper/shelf liner (about 2$ for a great big roll at target/walmart/etc.) for projects like these, and it works great. It's not as neat as laminate, but it has the same basic properties (water resistant, marker wipe-off-able, etc.). I love that you ran errands with his mustache and beard drawn on! Too funny! Wow, you are awesome. I love that you let your kids explore so freely. I love the activities you have and also the way you post about them. You really draw the reader in. I think I will do this activity with my children at home. the picture of him in the car with the beard is SO priceless. LOVE! i will try the face print out with my 19 month old son. how fun! Hello my friend! I would like to tell you that this write-up is awesome, great written and include almost all important info. I recently came to know about http://machinesuae.com/, their Laminating And Accessories are very effective.